For modern design and enhanced safety, Amarr garage doors make the best option. As one of the major garage door manufacturers, Amarr introduces ingenious ideas and makes great efforts to protect the environment and cover the needs of consumers. Among various door types, people can find an amazing collection in different materials, styles and strengths. The most amazing thing is that Amarr constructs doors with huge attention to details and tries to make the difference not only by offering new choices but also by emphasizing on the basic needs of people. Garage Door Repair Newton thinks the same way. We want to explore our options in the market in order to offer the greatest possible choices to our customers. 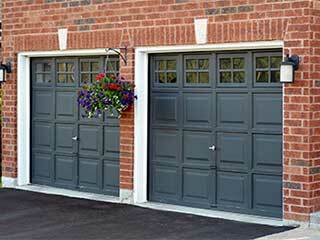 Amarr garage doors have great qualities and it is our honor to present them to you and also recommend them when you are ready to proceed with garage door replacement. What makes Amarr doors original! Amarr garage panels inspire elegance. There is something extravagant about them and this is attributed to their European style or the careful attention to small technical details. We trust the quality of Amarr because its doors are not only beautiful but are also constructed in an extraordinarily way. One of the main preoccupations of the company is to protect people from accidents. Based on the fact that each overhead door is used more than 1,500 times a year in every home and many people get injured from the sections of the door, Amarr constructs doors with a safe guard protection system. It uses patented pinch protection sections in order to avoid fingers getting caught and injured. The bottom brackets are also patented so that homeowners won't be able to accidentally remove the fasteners and get injured. Respecting the natural environment and the homeowner's money wasted on energy, Amarr manufactures doors with high insulation. Of course, the choice of the r-value depends on the actual needs of each house and this company offers a great range of options. It uses polyurethane or polystyrene materials and steel garage doors built with the safe guard sections also have a thermal seal in between sections for long-lasting and better insulated doors. At the same time, 90% of products are made of recycled content. Garage door parts are made of low gauge steel and the company offers great options among rollers, hinges and brackets for extra strength. It stands out for its original 20 gauge backer support plate, which secures better garage door hinges and roller carriers. Such initiatives make Amarr products strong, reliable and resistant with time. Our company appreciates such good work, because behind their great design, Amarr doors promise stability, durability and protection. Contact our company if you need to know more about the Amarr doors!